This post in partnership with Birds Eye. All thoughts and opinions are my own. I love Buffalo Chicken! 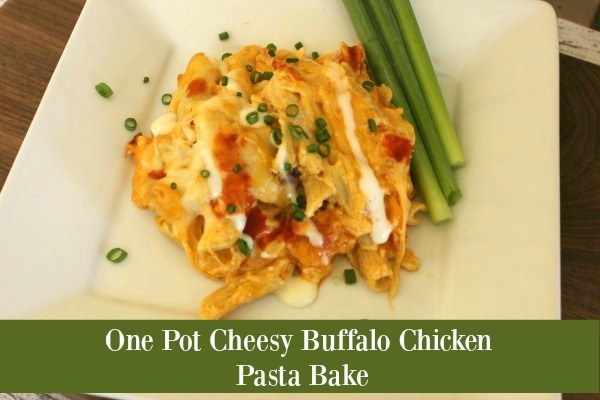 This One Pot Cheesy Buffalo Chicken Pasta Bake is way better than it has any right to be! Now, let me tell you why- I think everyone knows that I have an ongoing quest to find recipes where I can hide veggies from my avoid everything green at all cost family members. Like many moms, I’ve wished for a better way to encourage my family and myself to eat healthier. How simple would my life be if I didn’t have to hide veggies? As you can see from the pictures, Birds Eye has released Zucchini Lentil Pasta in their bless my soul convenient steam fresh bags. I call them this because I seem to have above average amount of days where people feel the need to say, Oh bless your heart. I think we all know some days are busier than others, some days are emotional, and some days we might eat chocolate for dinner. However, most days we are just striving for the middle -ish high ground where we get to enjoy a nice dinner with our family. I’m pretty sure we all understand that! 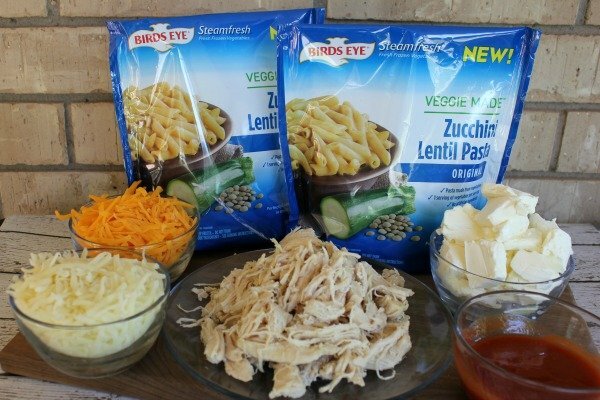 This Birds Eye pasta is no hassle, no clean up, and as if that’s not enough- one serving is actually a FULL serving of vegetables! I am so wow’d by this! There’s nothing green in sight for my picky eaters to complain or fuss about! Just a literal, “Here ya go,” “Swap in the good stuff!” My kids never knew the difference! While Technically, I cheat the one pan title a little here because I cook my chicken in large batches, shred, and freeze for later use. (which I recommend everyone do) You can absolutely start by cooking your chicken in an oven safe pan, and then use the same pan to bake in so that this remains a one pot meal. Preheat your oven, and lightly grease a 8-inch oven safe skillet or stove top safe casserole dish with olive oil. Cook the pasta noodles, according to the package directions. 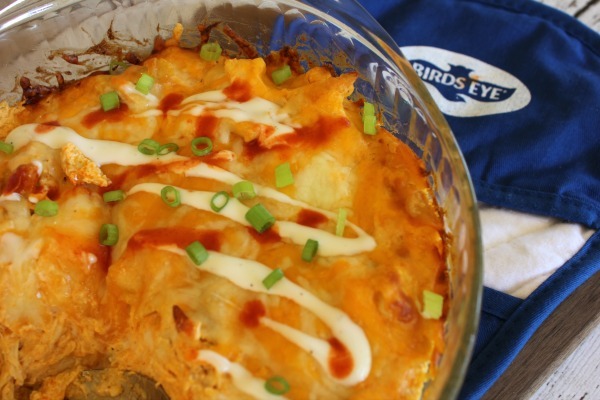 In your pan, stir together your softened cream cheese, ranch, and hot sauce until creamy. (It’s normal for it to look a bit lumpy) Add in your bite sized shredded chicken, 1/2 cup mozzarella cheese, and your cooked pasta noodles and stir to combine. Even out mixture a bit. Sprinkle remaining cheeses over the top. Bake for 20 minutes, or until cheese is melted. Remove and serve while hot with green onions, hot sauce, and ranch drizzles. After all, nothing beats hot cheese! Serves 6. As someone who has eaten wheat pasta for years and years, and who obviously KNEW I had replaced my regular pasta, I did note a slight difference, but like I said- I knew so maybe I just thought I knew! The texture seemed a bit softer than I typically eat my pasta, No problem though, next time I will shorten the cooking time as I have a high powered microwave, and it also cooks for another 20 minutes in the oven. But that’s more of a personal preference so adjust your time as needed. I only know there will be a next time, especially as it comes in several varieties with sauces like marinara, cheddar and alfredo! I do love alfredo! For your info~Not Medical Advice~Just from my understanding- While the ingredients of the Zucchini Lentil Pasta are gluten free, they are made in a facility that also process gluten so use extreme caution and follow your physician’s recommendation if you have an allergy. If you’re avoiding gluten as a lifestyle choice this may be a great product for you! Preheat the oven to 375 degrees. lightly grease a 8-inch oven safe skillet or stove top safe casserole dish with olive oil. Cook the pasta noodles, according to the package directions. 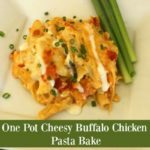 Add the chicken, 1/2 cup mozzarella cheese, and cooked pasta noodles to the cream cheese mixture and stir to combine..
Sprinkle the remaining two cheeses over the top. Bake for 20 minutes, or until cheese on top is melted. Remove and serve immediately with green onions, hot sauce, and ranch drizzles.